Stafford FM | SPARTANS 1ST XV vs STAFFORD 1ST XV. 13TH APRIL 2019. LEAGUE MATCH. SPARTANS 1ST XV vs STAFFORD 1ST XV. 13TH APRIL 2019. LEAGUE MATCH. 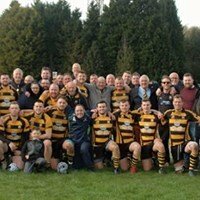 Magnificent Stafford rustle up six tries to end the season, avoiding relegation and securing Midlands 2 Rugby for Blackberry Lane. Stafford travelled to Spartans for the final 1st XV league match of the season. The County Town visited holding onto a narrow buffer of two points cushioning them from relegation. With the future in their own control and a bright spring day, the team travelled along with a very sizeable band of raucous supporters. Stafford showed their intention from the opening whistle with immediate pressure crashing through the opposition defence culminating in a penalty which was pushed between the posts by Christian Stelian for an early lead. Keeping the tempo high, Dean Fuggle found space to ghost through Spartans to pin the home side on their own line. A series of flowing passes allowing Alosio Yamoyamo to cross the line for a try. A handling error by Stafford built the platform for Spartans to hit back, three subsequent scrums on the visiting line ending in a penalty try as the referee’s whistle signalled the end of his patience. The teams continued to trade blows for a short period before a Spartans kick cleared their lines. The loose ball was pounced on by Rhys Williams whose counter attacked releasing the flying backs, Dan Mills removed a couple of defenders before Louis Dewsbury tore down the line with the final pass finding its way into the hands of Christian Stelian for the try, which he then converted. Stafford were dominant in all areas of play apart from the scrum where Spartans held an evident advantage. The visitors line speed was killing any momentum that the home team could build, but Spartans started to claw some territory through their dogged forward play. The hosts retained the ball to work their way up to the half way line before a prowling Stephen Frost intercepted a slightly long pass and demonstrating a good turn of speed, hurtled down the field fending off pursuing defenders, eventually collapsing over the line for a try, converted by Christian Stelian. Stafford went into half time leading 7-22 and very much in control of the game. Strong Spartans play opened the second half and Stafford had to dig deep to keep the resurgent attack out. The teams stood toe to toe with Spartans launching a series of punishing runs only to be rocked back by an equally fierce salvo of tackles from the visitors. As the momentum was blunted by a relentless spoiling defensive the ball was stolen for Spartans forcing them to concede a twenty-two drop out. The resulting kick travelled deep into opposition territory but was snatched out of the air by a leaping Callum Jones who then flew up the pitch stepping and bumping his way through sprawling Spartans, with only the final pass just missing its mark. Spartans dug deep finding new energy through their hard-working forwards and with a dominant scrum, the home side manoeuvred their way onto the Stafford line. Scrapping hard Dan Smith got the ball out to Dan Mills who made some hard yards before Tom Windibank continued the attack marauding through the defence along the length of the pitch with a supporting Rhys William covering the last few yards for the try and bonus point. Stafford had started to turn the tide and were finding success with a constantly pressing line speed. Dan Smith stole the ball from a subsequent line out, finding Callum Hoy who demonstrated his footballing skills by poking the ball through, Rhys Williams flew through to secure and Louis Dewsbury eluded all the defenders for the next try, converted by Christian Stelian. With twelve minutes left on the clock the game was all but won, but Stafford wanted one more. With a line out in the opposition half, the ball found its way to Dan Smith who charged through anything in his way for the final visiting try of the afternoon, converted by Christian Stelian. The Spartan forwards took the last points of the game as they used all of their bulk to drive over the line for a well-deserved consolation try to end the match. Alosio Yamoyamo; Angus Hamplett; Angus Lennon; Ben Chatfield; Ben Pryce; Callum Hoy; Callum Jones; Callum Lennon; Christian Stelian; Clayton Haigh; Dan Mills; Dan Smith; Dan Watts; Dave Austen; Dave Wareham; Dean Fuggle; Gareth Ley; Gareth O’Connor; Gareth Philips; Harry Brogan; Jack Harvey; James Wilkinson; John Naylor; Josefa Maka; Joseph Tait; Josh Arnold; Iliesa Bativaga; Lewis Cantrill; Louis Dewsbury; Matthew Walklate; Matt Smith; Neil Green; Niko Laqeretabua; Oscar Saunders; Philip Kay; Rhys Jones; Rhys Williams; Sam Chatfield; Sam Egerton; Sebastian Drakeford; Shaun Bickley; Stephen Frost; Stuart Lewis; Tom Berry; Tom Dunn; Tom Williams; Tom Windibank.